Northern Irish acts Arvo Party, Cherym and Hot Cops were playing on April, 2nd in Berlin, at Rotbart venue, in the historic bohemian village of Rixdorf, in the heart of Neukölln neighbourhood. The gig, organised by NI Music Prize and Oh Yeah Music Centre, with kind support from the Arts Council of Northern Ireland, the Embassy of Ireland in Germany, and British Council was a great way to export a sample of NI Music scene abroad. The Irish ambassador to Germany, Michael Collins, opened the night with a speech about the Brexit and its potential consequences for Irish people settled in Berlin and Germany. During the day at Rotbart, Berlin-Ireland Pro Choice solidarity sold merchandise to raise money for Alliance For Choice and the #NowForNI campaign. Only one word to say: wunderbar! 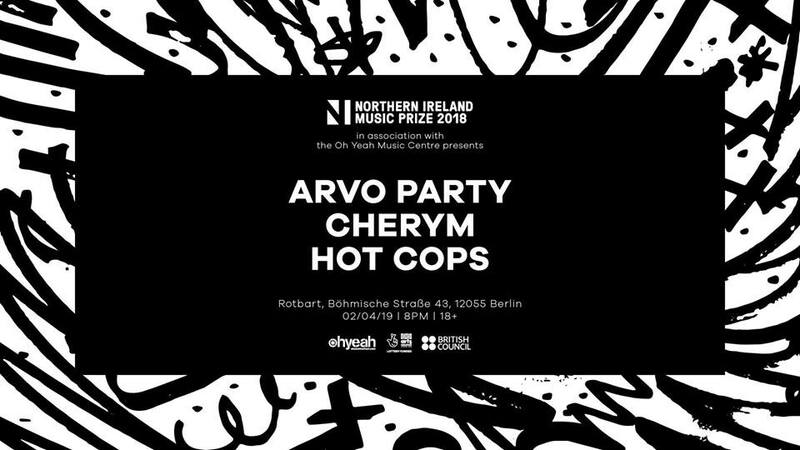 Arvo Party, Cherym and Hot Cops were all shortlisted in Best Single category at the NI Music Prize and Cherym was also shortlisted in the Oh Yeah Contenders Award.